← April… Here we go! Above: Burnout operations on the Cowbell fire, Big Cypress NP, Florida. April 2017. So here we are. Despite my best intentions, a combination of being busy and a lack of motivation to write have led to another two-month break in blog posts. I’ve flashes of things I wanted to write about here and there, but never pulled the trigger to get it done… so we’ll see what I can remember of the last sixty days as I write this post… I’ll say upfront that it won’t be my best work, as it’s really more of an update. Perhaps I’ll find time to write more eloquently about my Florida trip later in the year. 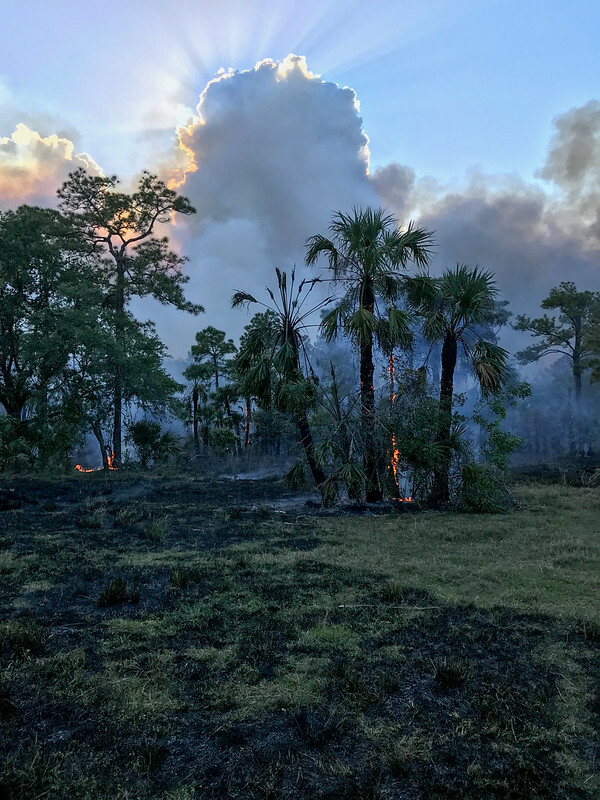 After writing the last blog post I went to Big Cypress NP in southwestern Florida for a fire assignment, which was my first trip to Florida for fire. After a lot of years of reading about Big Cypress, and running into folks from there on fires out west, I finally got to see it myself, and I have to say I thought it was a very unique area. Not sure it’s a place I could ever live and work, but I was very happy to be there for almost two weeks on a work trip. It was a pretty dry period there, and most places that would normally be holding water at that time of year were dry, which was the reason for the early start to fire season. In the fire area, most swamp buggy trails were bone dry, and the cypress domes and strands were drying out fast as well. Even in the short time I was there I noticed the cypress in particular drying up at a pretty noticeable rate. All told it was a fun trip filled with long work days where I was working on grad school coursework in the mornings, and then spending long days on the fire doing the data collection thing. I saw lots of wildlife, including alligators in almost every body of water big enough to fit one, a few snakes, and lots of birds. For a first fire trip to Florida, it was pretty good. After getting back to Boise from Big Cypress I had a few weeks at the end of April where there was a kind of break in the action, but I still had a lot to do. I got caught up on my work that had been put aside for the trip to Florida, squeezed in some refresher training and the spring pack test, and I packed and mailed a few dozen book sets for the Wildland Fire Leadership Development Program. I also started to pack and prepare for my summer detail to northwestern Oregon as the acting Unit Aviation officer for a handful of forests and one BLM district. While it was good to be home in Boise as the warmer and sunnier summer weather started to arrive, it wasn’t exactly a soothing and restful break. As April rolled into May I found myself throwing a few bags in the back of my Toyota and hitting I-84 with the Mt. Hood NF as my destination. I started out in the sunshine in Boise, and by the time I hit Hood River on the Columbia I was in the famous Pacific Northwest clouds and rain. The month since then has been blur of meetings, new faces, new places, and a lot of driving up and down I-5. The main offices I cover span a distance from Eugene, OR, to Vancouver, WA, with a few outlying offices farther north and south than those two cities, which means I’m in for a lot of windshield time this summer. It’s been a good month so far, and I look forward to seeing what the rest of the detail brings. Around the time I traveled to Oregon, mom and dad were spending a few weeks up in the Seattle area visiting my sister and her family, and I was able to sneak up and see them all on two consecutive weekends, and again last weekend, although by then mom and dad had left. With my busy schedule for the past few years, it’s been a pretty rare occasion to visit family in May, and especially to see everyone all at once. It’s been good to be in the PNW so far, although I have to re-condition myself to PNW driving, where you’re almost considered a hazard to other drivers if you’re not driving ten MPH over the limit while texting on your cellphone. I always forget just how many people live along the I-5 corridor from Eugene to Seattle, and I’m slowly getting used to being in a pretty urban area. While I complain about Boise being too urban for me from time to time, the reality is that compared to Portland and Seattle, it’s a pretty small and quiet city. Not to mention comparing it to even larger cities like Los Angeles… Boise is barely a dot on the map compared to urban SoCal. That’s about all that’s fit to print for now… it’s been a busy year for me so far, and I see no indication that it’s going to slow down much as fire season starts to wind up and things get busy.